TENPS are group of people who share a common interest in conserving, learning about and growing native plants in the Top End of the Northern Territory, Australia. Their website has a wonderful index to Top End Native Flowers, organised by colour. Click on the logo or title above to go to the website ! The Environmental Defenders Office (NT) Inc. (EDONT) is a not-for-profit community legal centre operating in the Northern Territory which specialises in public interest environmental law. The EDONT advises and acts for individuals, traditional owners, community groups and conservation groups seeking to protect the environment in the public interest. At the Territory Wildlife Park (Berry Springs) not only do you see wildlife up-close in their natural habitats, you meet them walking through tree top aviaries, strolling around a natural lagoon and even get to interact with them during daily presentations. The Parks and Wildlife Commission of the Northern Territory is responsible for a comprehensive system of land and marine protected areas across the Territory – managing over 90 parks and reserves for conservation and nature based recreation and tourism. 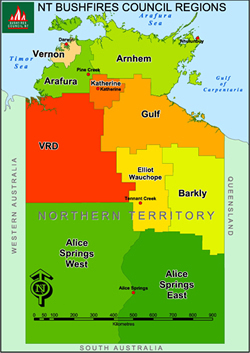 The Park and Reserve system encompasses over 45,000 square kilometres, from the arid Centre to the tropical Top End, approximately 3.5% of the Territory’s land mass. Thirty two of the over 90 parks and reserves are jointly managed in partnership with Aboriginal people. Territory Natural Resource Management (TNRM) is an independent not for profit organisation that works with landholders, groups, industry and government to ensure sustainable management of our water, land, soils, plants and animals. NT Fire and rescue are responsible for implementing the bush fires Act and carrying out prescribed burning, as well as fire mitigation in the Darwin Area and immediate rural area. (North Australian Fire Management) is a web site showing fire history, hot spots, fire scars through mapping data. This could be useful in looking at the fire history, near and surrounding your land. The Weed Management Branch works to preserve our natural resources, industries and lifestyles by preventing the introduction and spread of weeds. Managing rapid responses to new, high weed risk incursions is also a priority. There are over 4000 Landcare groups across Australia. Landcare groups and Landcare projects can be urban, rural, regional or agricultural in nature. Landcare groups characteristically consist of Friends of groups, community environmental groups, land managers or land owners such as farmers or primary producers. Current trends in Landcare include adaptation of farming practices for climate change and use of traditional ecological knowledge in land management.